This seat straps onto nearly any chair, it's height adjustable (by about 3") & the tray moves forward by about 2". This seat can replace a high chair--no need to spend a mint on a big, ugly piece of baby furniture, just strap this little device onto one of your kitchen chairs. You can use it when you go to restaurants--the seat folds down so it's easy to carry & the tray has a cover (not shown) so you can just wash it at home. The tray goes in the dishwasher & the seat is really easy to wipe down. I found it a nice size for Sprout at six months. 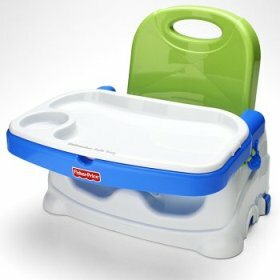 The tray isn't as high as other high chairs I've seen where babies are nearly eye-level with their food at first & would have difficulty picking up food on their own. The height it's still perfect at 16 months. Once your child is old enough to sit at the table, you can leave the tray off & use it as a booster until they're 45 lbs. Toys R Us & lots of other stores new, also there are always a few used on Craigslist. About $40 new, or around $20 used. *I didn't get any incentive to review this product--I just like it a lot.